Soane's screen with its arched entrance and flanking lodges was completed in 1796 but by 1804 cracks had developed in the central arch and it was eventually demolished and replaced by another screen designed by H.E.Kendall. See D.Adshead, op. cit, for an account. 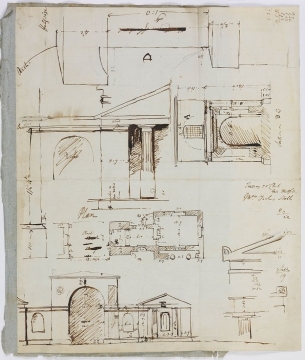 For further drawings at the Soane Museum see SM volume 68/13-17 (variant designs dated 24 January 1794) and SM 62/8/45-6 (copies of surveys dated 28 April 1818). The drawing catalogued above was probably made in 1794 after 24 January. It is close to the survey drawings of 1818 but without, for example, the columns in antis. 'Mr Mitford' was William Mitford of Pitshill near Tillington, Sussex for whom, in March 1794, Soane provided several designs for alterations. A misunderstanding involving the builder led Soane to claim that he had destroyed the drawings. In fact, there are in the Soane Museum, floor plans dated 5 March 1794 (SM 46/3/8-9) and designs for the principal front (SM volume 68/1-4). For the Hon. Mrs Yorke, Soane did several jobs including Sydney Lodge, Hamble, Hampshire, 1789-1798.